As fighting rages across Europe and the Middle East it is easy to forget that the war is also taking place in Africa. 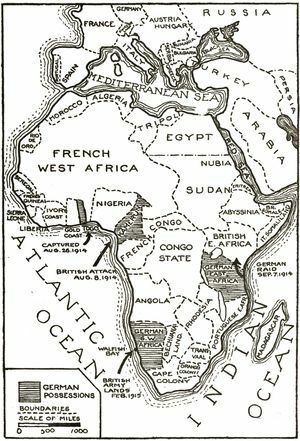 German forces continue to resist in Kamerun, South West Africa and German East Africa. The Germans in South West Africa are in increasingly desperate straits but their comrades in East Africa and Kamerun are having better luck. After the failure of the British amphibious assault on Tanga last November, the Germans in East Africa are largely being left alone, for now at least. In Kamerun the situation is more complex. The Allies have overrun much of the colony and are besieging the German base of Mora in the north. But other German units retain freedom of movement. These include a mobile column based in Garua. The Germans at Garua raid across the border into British Nigeria. They attack the fortified outpost of Gurin. The British commander is killed in the fighting but the Germans are obliged to retreat, suffering considerable casualties themselves. If it had happened on the Western Front this battle would be so inconsequential as to not be worth mentioning: total casualties for both sides are less than a hundred men. But the boldness of the Germans troubles the British and makes them more determined to do something about the Germans’ base at Garua.